Georgia Totto O'Keeffe (November 15, 1887 – March 6, 1986) was an American artist. 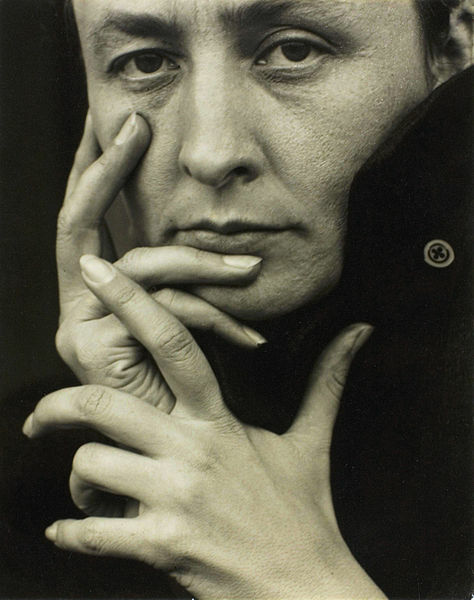 Born near Sun Prairie, Wisconsin, O'Keeffe first came to the attention of the New York art community in 1916, several decades before women had gained access to art training in America’s colleges and universities. 655 – Battle of Winwaed: Penda of Mercia is defeated by Oswiu of Northumbria. 1315 – Battle of Morgarten: the Schweizer Eidgenossenschaft ambushes the army of Leopold I. 1533 – Francisco Pizarro arrives in Cuzco, the capital of the Inca Empire. 1688 – The Glorious Revolution begins: William of Orange lands at Brixham. 1777 – American Revolutionary War: After 16 months of debate the Continental Congress approves the Articles of Confederation. 1791 – The first U.S Catholic college, Georgetown University, opens its doors. 1806 – Pike expedition: Lieutenant Zebulon Pike sees a distant mountain peak while near the Colorado foothills of the Rocky Mountains (it is later named Pikes Peak). 1859 – The first modern revival of the Olympic Games takes place in Athens, Greece. 1864 – American Civil War: Union General William Tecumseh Sherman burns Atlanta, Georgia and starts Sherman's March to the Sea. 1889 – Brazil is declared a republic by Marechal Deodoro da Fonseca and Emperor Pedro II is deposed in a military coup. 1923 – The German Rentenmark is introduced in Germany to counter Inflation in the Weimar Republic. 1928 – The RNLI Lifeboat Mary Stanford capsized in Rye Harbour with the loss of the entire 17 man crew. 1935 – Manuel L. Quezon is inaugurated as the second president of the Philippines. 1942 – World War II: The Battle of Guadalcanal ends in a decisive Allied victory. 1945 – Venezuela joins the United Nations. 1951 – Greek resistance leader Nikos Beloyannis, along with 11 resistance members, is sentenced to death by the court-martial. 1959 – Four members of the Herbert Clutter Family are murdered at their farm outside Holcomb, Kansas. 1966 – Gemini program: Gemini 12 completes the program's final mission, when it splashes down safely in the Atlantic Ocean. 1966 – A Boeing 727 carrying Pan Am Flight 708 crashes near Berlin, Germany, killing all three people on board. 1967 – The only fatality of the X-15 program occurs during the 191st flight when Air Force test pilot Michael J. Adams loses control of his aircraft which is destroyed mid-air over the Mojave Desert. 1969 – Cold War: The Soviet submarine K-19 collides with the American submarine USS Gato in the Barents Sea. 1969 – Vietnam War: In Washington, D.C., 250,000-500,000 protesters staged a peaceful demonstration against the war, including a symbolic "March Against Death". 1969 – In Columbus, Ohio, Dave Thomas opens the first Wendy's restaurant. 1971 – Intel releases world's first commercial single-chip microprocessor, the 4004. 1976 – René Lévesque and the Parti Québécois take power to become the first Quebec government of the 20th century clearly in favour of independence. 1978 – A chartered Douglas DC-8 crashes near Colombo, Sri Lanka, killing 183. 1979 – A package from the Unabomber Ted Kaczynski begins smoking in the cargo hold of a flight from Chicago to Washington, forcing the plane to make an emergency landing. 1983 – Turkish Republic of Northern Cyprus is founded. Recognised only by Turkey. 1985 – A research assistant is injured when a package from the Unabomber addressed to a University of Michigan professor explodes. 1985 – The Anglo-Irish Agreement is signed at Hillsborough Castle by British Prime Minister Margaret Thatcher and Irish Taoiseach Garret FitzGerald. 1987 – Continental Airlines Flight 1713, a Douglas DC-9-14 jetliner, crashes in a snowstorm at Denver, Colorado Stapleton International Airport, killing 28 occupants, while 54 survive the crash. 1987 – In Brasov, Romania, workers rebel against the communist regime of Nicolae Ceau?escu. 1988 – In the Soviet Union, the unmanned Shuttle Buran makes its only space flight. 1988 – Israeli-Palestinian Conflict: An independent State of Palestine is proclaimed by the Palestinian National Council. 1988 – The first Fairtrade label, Max Havelaar, is launched in the Netherlands. 1990 – Space Shuttle program: Space Shuttle Atlantis launches with flight STS-38. 1990 – The People's Republic of Bulgaria is disestablished and a new republican government is instituted. 2000 – A chartered Antonov An-24 crashes after takeoff from Luanda, Angola killing more than 40 people. 2000 – Jharkhand state comes into existence in India. 2003 – The first day of the 2003 Istanbul Bombings, in which two car bombs, targeting two synagogues, explode, killing 25 people and wounding about 300. Additional bombings follow on November 20. 2005 – Boeing formally launches the stretched Boeing 747-8 variant with orders from Cargolux and Nippon Cargo Airlines. 2007 – Cyclone Sidr hit Bangladesh, killing an estimated 5000 people and destroyed the world's largest mangrove forest, Sundarbans. Leopold III, a public holiday in Lower Austria and Vienna.